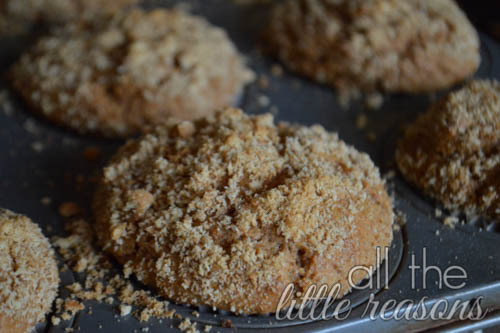 After I started baking this morning, it hit me that these muffins would be the most wonderful way to use leftover sweet potatoes from Thanksgiving! I know most people doctor them up with sugar and marshmallows. In that case, I would back down on the 1/2cup of sugar that is called for in the recipe. If I were using Thanksgiving leftovers, I would start with 1/4c. sugar and taste the batter before adding the eggs at the end. At that point I would add a bit more if it needed more. Start by mixing the wet ingredients together. In a separate bowl, mix dry ingredients together – using only 3/4 c of the crumbs. Combine the two bowls of ingredients and mix well. 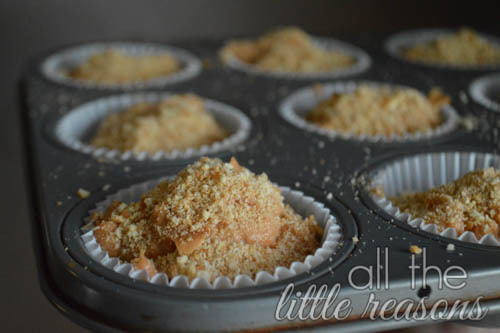 Fill 12 muffin liners 2/3 full and top with remaining 1/4 cup wafter crumbs. Bake at 375 degrees for 25 min or until toothpick comes out clean. I think you’ll find these to be so moist and fluffy because of the use of moist sweet potatoes and sour cream. I used freshly milled spelt and I was amazed that it can turn out such a beautiful texture in a muffin! 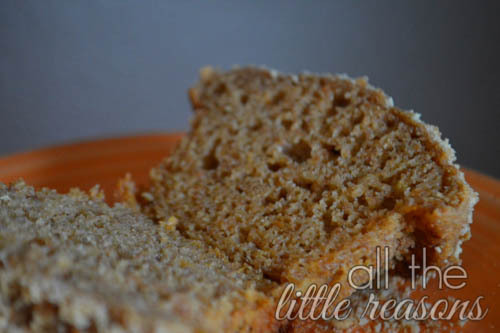 I would never believe it’s completely whole grain if I hadn’t made it myself! I hope you love them. Happy Thanksgiving! Mix dry ingredients together, including only 3/4c. wafer crumbs. In a separate bowl, mix wet ingredients. Combine wet and dry ingredients. Line 12 muffin tins with liners. Fill 2/3 full. Top each muffin with remaining 1/4c. vanilla wafer crumbs. Bake at 375 degrees for 25 minutes, or until toothpick comes out clean.